*New Orleans, LA – ESSENCE Communications President Michelle Ebanks announces an extended agreement with the State of Louisiana and the City of New Orleans to host the ESSENCE Festival ™ through 2019. The annual 4-day event features entertainment, empowerment, and cultural experiences during the day and the world’s best performers each night. Touted as the country’s largest live event—the ESSENCE Festival attracted more than 550,000 attendees for its July 4th weekend 20th anniversary celebration. More than 80 performing artists—including some of the biggest names in the entertainment industry such as Prince, Mary J. Blige and Lionel Richie—performed at the event’s nighttime concerts and over 150 speakers—including Robin Roberts, Alicia Keys, Steve Harvey and Rev. Al Sharpton—participated as part of the Festival’s daytime experience. 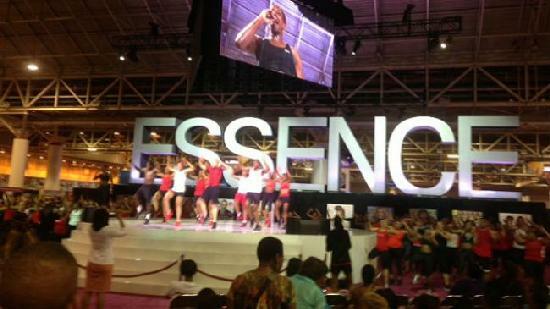 The State of Louisiana and City of New Orleans played a key role in enticing ESSENCE® to agree to a contract extension. Essence Communications Inc. (ECI) is the number one media company dedicated to African-American women, with a multi-platform presence in publishing, live events and online. The company’s flagship publication, ESSENCE magazine, is the preeminent lifestyle magazine for African-American women; generating brand extensions such as the Essence Festival, ESSENCE Black Women in Hollywood and Black Women in Music, Window on Our Women and Smart Beauty consumer insights series, the Essence Book Club, Essence.com, and ventures in digital media. For 44 years, ESSENCE, which has a brand reach of 11 million, has been the leading source of cutting-edge information and specific solutions relating to every area of African-American women’s lives. Additional information about ECI and ESSENCE is available at www.essence.com. Time Inc., a division of Time Warner, is one of the largest branded media companies in the world reaching more than 130 million Americans each month across multiple platforms. With influential brands such as TIME, PEOPLE, SPORTS ILLUSTRATED, InStyle, REAL SIMPLE, Wallpaper, Travel + Leisure and Food & Wine, Time Inc. is home to celebrated events and franchises including the FORTUNE 500, TIME 100, PEOPLE’s Sexiest Man Alive, SPORTS ILLUSTRATED’S Sportsman of the Year, the Food & Wine Classic in Aspen and the ESSENCE Festival.